In Kuwait and Qatar, we find tensions between a focus on female education that encourages women to participate in the labor market, alongside policies that support women’s role as primary caretakers and homemakers. Lavish, non-taxed rentierist welfare has given rise to a globally unparalleled reliance on domestic workers and the development of a two-tier employment structure where most female citizens work in the public sector, while an overwhelmingly large segment of the noncitizen female labor force is employed as domestic workers. While the two states share cultural and socio-economic characteristics, Kuwait and Qatar differ with regards to how women’s issues are organized and addressed politically. The historical experiences of political pluralism shed light on variances in social pressures for expanded female citizenship. In Kuwait, there exist autonomous – though variably weak – pressures that have strengthened female citizenship by buttressing civil and economic rights where women have seen their autonomy expanded. In Qatar, female citizens are part of wider state-building strategies primarily initiated and defined by the ruling al-Thani dynasty. 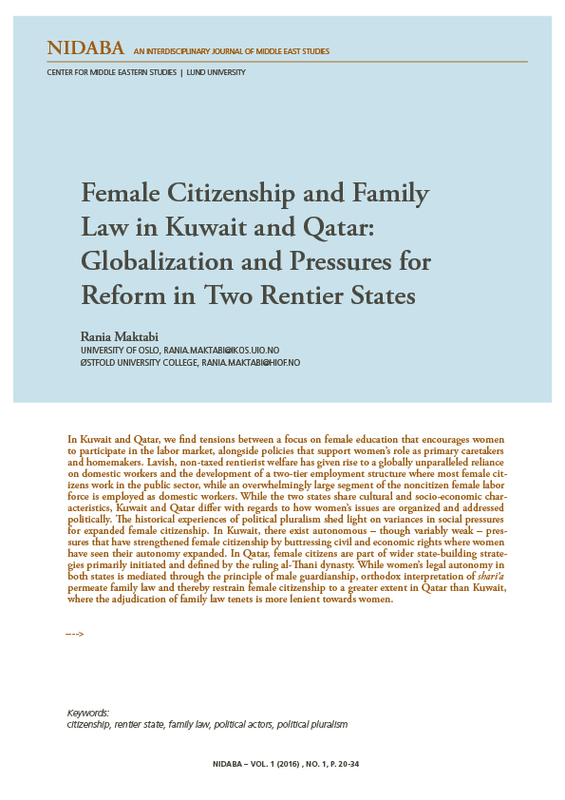 While women’s legal autonomy in both states is mediated through the principle of male guardianship, orthodox interpretation of shari’a permeate family law and thereby restrain female citizenship to a greater extent in Qatar than Kuwait, where the adjudication of family law tenets is more lenient towards women.